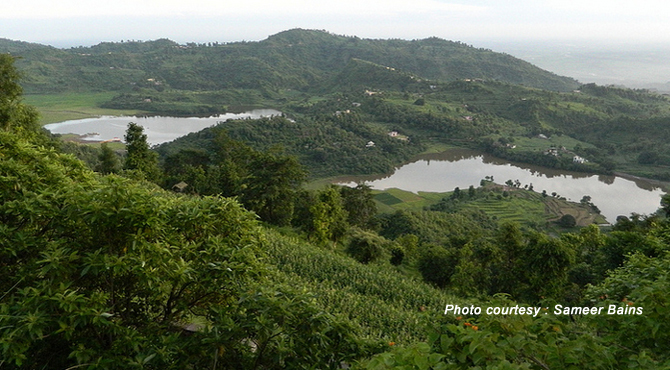 Nestled in the lower Shivaliks, Morni, also called Bhoj Jabial is the only hill station in Haryana. A cool retreat, Morni is a worth visiting place for one who wants to enjoy nature..... Quiet and Calm, it is blessed with beautiful rivers, streams, hot springs, waterfalls, forests etc. Situated at a height of 1220 meters above sea level, in Panchkula district of Haryana, Morni is just five hours drive away. Named after the queen who is believed to have ruled this area, this place got attention as the summer retreat of a former Deputy Prime Minister, Mr Devi Lal. Morni has a thick evergreen forest which keeps this hill station cool all round the year. It also serves as an excellent jumping off point for thrilling treks, rock climbing and other adventure sports through this thick forest. Morni Hills blessed with fascinating range of flora and fauna and bird watching . Among the exotic flora found in Morni are Sal, Neem, Mango, Ritha, Pipal, Jamun, Shisham, Amaltas. Morni hills is a natural habitat for wide range of bird species including Kalij Pheasant, Peacock, Red jungle fowl, Blue Peafowl, Black francolin, Himalayan bulbul,Quails and Oriental turtle dove. It also boasts animals including Jackals, Langur, Hare, Hyenas, Nilgai, Sambar, Barking deer and Leopards. In Morni, there are many picnic spots as well as several ideal locations. Among the spurs of hills, lie two lakes. Even though they are separated by a hill, they seem to be interconnected by an underground channel as the level of two lakes remains the same. The larger lake is is about 550 meters long and 460 meters broad and the other about 365 meters either way. The local people of Morni, consider these lakes as sacred. A 12th century temple dedicated Trimurti (the Hindu Trinity) is situated on banks of these lakes. It has 2 small man-made lakes called Tikkar Taal (10 km from Morni), Bada tikkar and chota tikkar. Tikkar Taal offers good attraction for tourist like an adventure theme park with river crossings, Tarzwan swings and tree houses. Dormitories is made available by Haryana Tourism at Tikkar Taal. Another attraction in Morni is a herbal park by the Forest Department, Haryana. More than 100 varieties of medicinal plants and herbs can be found in this park.